Yes, there are only three ingredients in this tomato sauce. I was skeptical when I first saw this recipe at Smitten Kitchen, but this site had yet to steer me wrong and so I trusted the author’s judgment. The butter creates a velvety, rich sauce and the onion flavors this perfectly.Once the sauce was finished, I buzzed it with my stick blender to create a smoother texture. There is no need for herbs or garlic and try to resist “doctoring” this up. What is even better about this is that you probably have all the ingredients needed in your pantry. It’s great for busy moms who want to try out new but not intimidating, made-from-scratch recipes. And who doesn’t like this sort of simple comfort food? 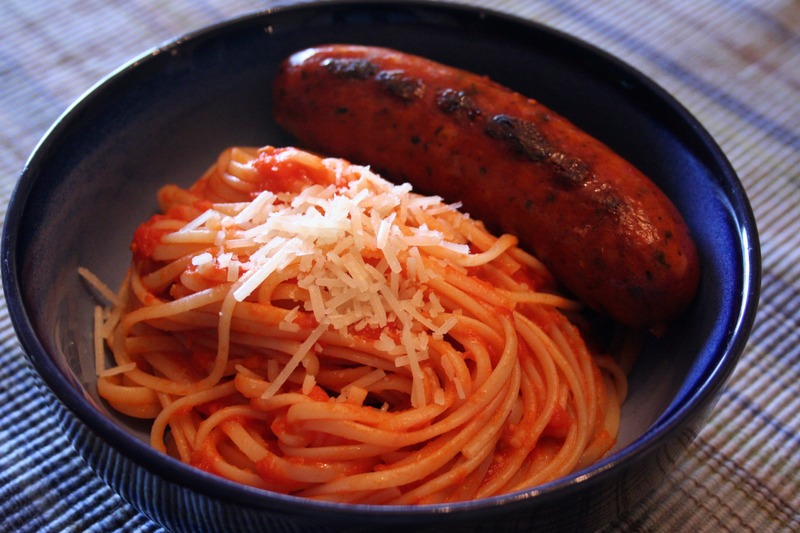 I used Linguine fini for this and served Italian style chicken sausage and everyone really loved it, even my picky husband who doesn’t like tomato sauce. Thanks for reading, enjoy! Put the tomatoes, onion and butter in a heavy saucepan (it fit just right in a 3-quart) over medium heat. Bring the sauce to a simmer then lower the heat to keep the sauce at a slow, steady simmer for about 45 minutes, or until droplets of fat float free of the tomatoes. Stir occasionally, crushing the tomatoes against the side of the pot with a wooden spoon. Remove from heat, discard the onion, add salt to taste. 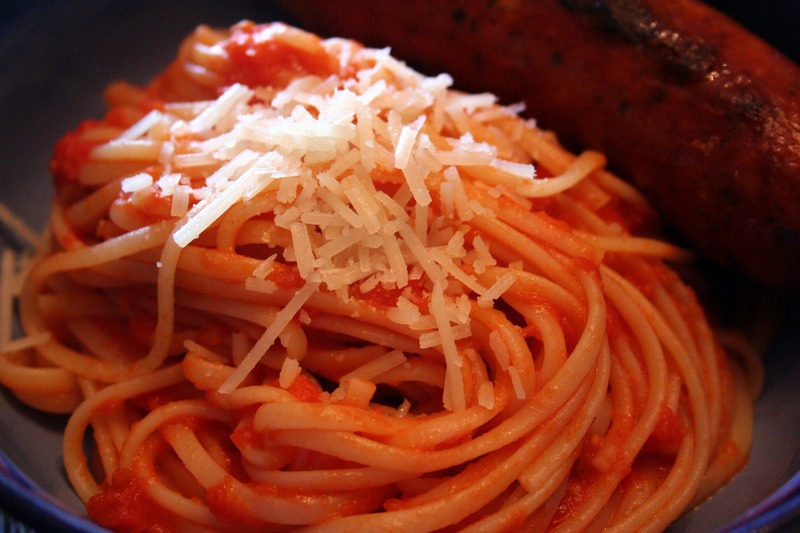 Serve with spaghetti, with or without grated parmesan cheese.